Since 2005, when I was diagnosed with Early Onset Parkinson’s Disease I have been on a journey of recovery. Parkinson’s disease is a fairly common age-related and progressive disease of brain cells that affect movement, loss of muscle control, and balance. Because falls are a frequent complication of Parkinson’s disease it was important for me to find ways to reduce my risk of falling. 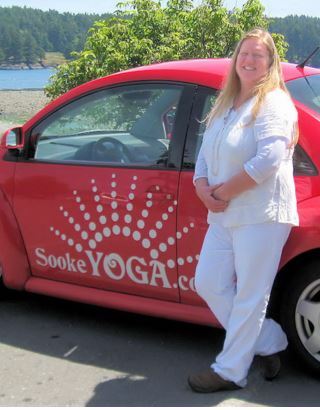 When I moved to Sooke on July 29, 2016, the first item on my agenda was to join Sooke Yoga, however; three days later, I lost my balance when I tried stopping my seven month old puppy, Jordi, from chewing my clothes. I spun around as he made a mad dash for the door; I fell, and broke my hip. Thankfully, it was my sister who was helping with the move who called 911. I hate to think what might of happened if she wasn’t there. I did not want to be a statistic, like my uncle, who fell in his condo and was found dead four days later because he was unable to get off the floor. After spending 21 days in V.G.H. 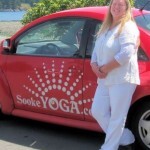 and the next eight months in recovery, I joined Sooke Yoga. There, I found a huge reservoir of insight, help and wisdom. Because of my weakened condition, my primary goal was to be able to get off the floor by myself. Over the past many months, I have been working on strengthening my core muscles and now feel confident that I can get off the floor if I fall. I started with Heather’s restorative class one evening per week. Then, as I improved, Alanda suggested Kundalini yoga each Monday to Friday from 12-1 p.m.
People started commenting on how much better I was looking. I wasn’t hunched over; I was standing tall and walking a lot better. Recently, I joined Amy’s Therapeutic yoga class on Monday and Thursday morning. This is like Bootcamp yoga but as I continue my confidence grows and I see more positive results. In addition to certified, dedicated, and experienced instructors at Sooke Yoga, they are all about showing you how to help yourself and put you in full control of your own recovery. Looking for a gentle form of yoga? Consider this current offer from Sooke Yoga! Thank you Deborah. You are an inspiration! I am thrilled to be a part of your healing journey. Keep on trucking!